2 days after 1 of the best Con's I've personally every had. Niagara Falls Comic Con was fantastic!! Got to meet a lot of new faces and some old, but a lot of good responses from people to the work!! Check out Niagara Falls Comic Con for next year or pictures from this year, completely amazing!! 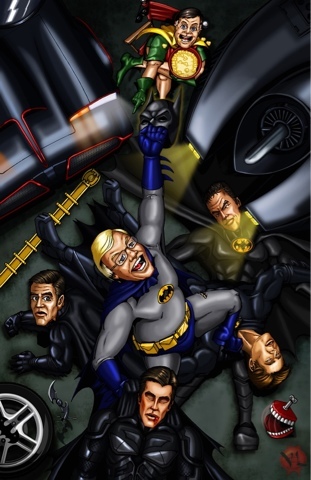 But the highlight, giving Adam West the poster of posters!! 7 1/2 foot poster of the West beating all other Bats!! His reaction priceless. Now to other news,.. Fanexpo coming in August,.. You can still check all new pages of ALL the books and posters at www.kevingjackaljohnston.com and just more and more coming. I try to write on this but damn I hate writing.